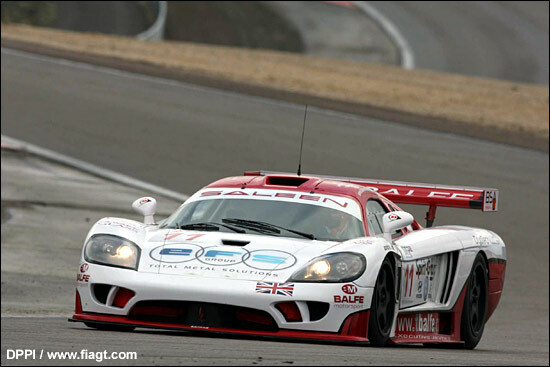 The Spirit Motor Group backed Balfe Motorsport team went to the FIA GT media/test days at Dijon in an optimistic mood, following two incredibly successful tests with its new Saleen S7R. The trip was a move into the unknown, being the first time that any of the FIA GT teams had gone head to head on the same stretch of tarmac. Bitterly cold weather and even snow (at least at the airport when the team arrived) was what greeted them. Although, by the start of day one, the sun had started to try and make it feel like spring in the middle of France, with a dry track to test on. Shaun Balfe made the first initial trip out onto the circuit and set about building up a steady stream of laps, learning the layout and getting everything fully up to temperature. However, after a handful of laps he radioed the team and cruised past the pits with a gear problem. The team brought the car back to the garage from the end of the pit-lane and checked everything over. Everything seemed fine, so Shaun was duly dispatched back out again to carry on. Three laps later, it did it again. But this time he was able to cruise into the pit-lane. The team went through everything, with the data showing nothing out of the ordinary and nothing physically wrong once they’d put the car in the air and started checking it over. Shaun went out once more, did two laps and brought the car in, everything seemed fine and Jamie Derbyshire took over for his first stint behind the wheel. Unfortunately, he only got half a lap before the problem finally became terminal, stranding him out on the circuit. Once the car was back the team set about tracing the fault. It was finally found to be the main shaft into the gearbox, which had broken. But what amazed the team the most was that the shaft had broken, but had managed to grind the two pieces together to allow Shaun to do his handful of laps when it had cooled and in essence ‘welded itself’. Before getting hot again and stopping the car. And this happened three times! With this being the only major available time for the team to get circuit knowledge and track time it was important that it tried to get the car back out for the second day, even if it was to make sure the gearbox fault had been fixed in the run up to Silverstone. So, several people on several mobile phones made several phone calls and a plan was formed for the new parts to be driven overnight and left for the team to have an early start in readiness for Wednesday morning’s session. With nothing left for the team to do, while waiting for the parts to arrive, they left to get an early night before driving back to the circuit at 4am to (hopefully) find new parts waiting for them to fit. As the team rolled up in the darkness the next morning the parts were there, ready to fit. A 9am deadline was called for the car to be ready so that it could be straight out for the first session. The lads in the team excelled themselves, with the car being briefly struck up to check for all gears at just after 7:30am. Final touches were made to the car and then it was a case of waiting for the drivers to turn up. They were lucky enough to get full nights sleep! So, as the pit-lane opened at bang on 9am, Jamie was backing the car and first one out onto the track. And after two laps, came in, the team checked everything over to make sure about the installation and he was back out and able to get the much needed laps for himself and the car. The only problem with the morning session was it was wet! However, the sun was still trying to come through and the track was starting to dry as the session went on. Jamie was getting comfortable and as he got up to speed he was matching sector times with the Vitaphone Maserati’s at the top of the timing screens. A great start for his return to the GT1 category and against machinery that is latest generation compared to when he drove the Lister Storm. Midway into the session and Neil Cunningham climbed aboard and got his first chance to drive. As the track got increasingly drier he started to turn in a couple of very quick laps and just before being called in he went P1 on the timing screens. It was exactly what the guys in the team needed after the problems overnight. With just ten minutes of the session left to go two or three cars went out again and the Balfe car finally ended the morning in third place. Still, a great start to the day for the new kids on the GT1 block. As the team concentrated on getting as much track time for the car as possible, the drivers that weren’t in the car now had something else to do. Talk to a TV camera. The team for the UK coverage of the Championship, the brand new ‘Player’ channel, was out in force on Wednesday and after learning that the team is the only regular British GT1 one runner, complete with two British drivers, they were in demand! Both Shaun and Jamie were grilled with a multitude of questions and filmed putting on helmets and gloves for advertisement pieces through the season and even took pit to car radio conversation over the course of the day. It looks like the team will play a good part in the UK coverage over the course of the season, which is great for the team and all of its sponsors. But from what we saw from the TV crew and talked to them about the channel’s plans it looks like they will be offering GT fans on the UK a really great package. All of the drivers got stints behind the wheel over the course of the day, with just a handful of small niggles bringing the car into the garage for checks. However, the team came away from the test still on a positive note. Shaun Balfe especially happy with the way the team had worked to fix the problem and with the pace of the car once they got out on track. “The team worked so hard to get us out,” he said. “Perhaps harder than they’d expect to at a race weekend. It’s really great that they got the car back out and with Jamie and Neil’s pace in the early stages of the day it was just what the guys needed. I’m positive that as a team we can offer a competitive package heading into the Tourist Trophy at Silverstone. We can overcome problems with the best of them and our line-up is solid, so we’re definitely looking forward to it,” he added. Jamie Derbyshire was full of praise for the team too, especially after the problem on day one. “It was definitely some great work by the guy s to get the car out,” he said. “The initial period of not knowing what the problem was meant that we were either looking at fixing it or going home early, none of us wanted to do that. Once the car was running everything went well and it felt good and easy to drive. It was nice to be trading times with the guys at the top of the timesheets for a while, it means we can move forwards from this point when we’ve worked one the set-up some more. I’m really looking forward to Silverstone now. It will be good to start with our home event for a change,” he added. Cunningham was obviously happy to have topped the timesheets on his proper FIA GT1 debut. “I wasn’t really pushing the car when the time came,” he grinned. “I had followed one of the Maserati’s for a couple of laps and could see that it was struggling in the greasy circuit too so it was the same for everyone. I had to hang onto it in a couple of place, but the grip was coming in and the car felt strong, so I just kept pushing bit by bit. There’s definitely a lot more to come, but it will as the team gathers more data and fine tunes the set-up for us. Silverstone’s a track that we all know, so that will be good and hopefully we can spring a surprise or two,” he added.